"Balwhidder" redirects here. For the fictional minister, see Annals of the Parish. For the Viscount of Balwhidder, see Duke of Atholl. Balquhidder (/bælkˈhwɪdər/ ( listen); Scottish Gaelic: Both Chuidir [ˌpɔˈxutʲɪɾʲ] or Both Phuidir [ˌpɔˈfutʲɪɾʲ]) is a small village in the Stirling council area of Scotland. It is overlooked by the dramatic mountain terrain of the 'Braes of Balquhidder', at the head of Loch Voil. Balquhidder Glen is also popular for fishing, nature watching and walking. St Angus came to Balquhidder Glen in the 8th or 9th century and recognised what the Celts called a "thin place" where the boundary between Earth and Heaven was close. He knelt and blessed the glen at the spot where the house "Beannach Aonghais" (Gaelic 'blessing of Angus') now stands and built a stone oratory at Kirkton, where he spent the rest of his life. Angus was the first to bring Christianity to Balquhidder. The Maclaurins acquired the district as early as the 9th century and occupied it for several hundred years until ousted by the Macgregors, a neighbouring clan, who had repeatedly raided their lands, and in 1558 slew the chief and many of his followers. 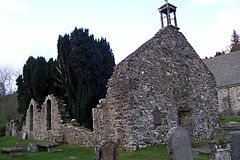 The Parish is also an ancient seat to branches of the Stewart and Fergusson Clans. The Reverend Robert Kirk, who translated parts of the Gaelic Bible and wrote The Secret Commonwealth, also lived here for several years from 1664. 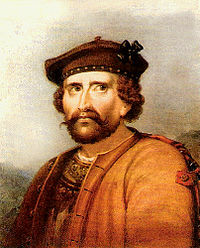 Rob Roy lived and died in Balquhidder. After his principal creditor, James Graham, 1st Duke of Montrose seized his lands, Rob Roy waged a private blood feud against the duke until 1722, when he was forced to surrender. Later imprisoned, he was finally pardoned in 1727. He died in his house at Inverlochlarig Beg, Balquhidder, on 28 December 1734. Glen Buckie, now a quiet backwater on the south side of Balquhidder Glen was the scene of one of the last acts of the 1745 Jacobite rising. Dr Archibald "Archie" Cameron of Locheil had returned to Scotland in the early 1750s hoping to raise support for a possible last-ditch coup against George II. He was captured in the glen, and was later hanged in London, the last Jacobite to be executed for treason. The local kirkyard is the final resting place of Rob Roy; his grave is marked with the appropriately defiant motto 'MacGregor Despite Them'. He lies with the remains of his wife and two sons, the graves marked by three flat stones. 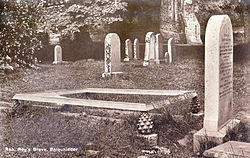 One of these is contemporary, but the remaining two are re-used medieval grave monuments. Behind the present kirk is Tom nan Angeae, the hill of fire, where until the 19th-century hearth fires were renewed at Beltane and Samhain to encourage ancient gods to bring warmth to the land. St Angus was buried at the foot of this hill and a flagstone laid over him which stands today in the present church. This stone, formerly in the floor of the medieval church, has a crudely incised figure of a priest holding a chalice. The carving is probably late medieval in date. There are some foundations of the east end of the small medieval parish church of Balquhidder around the grave of Rob Roy and his family (which seem deliberately to have been buried at the site of its altar). A few metres to the west are the roofless ruins of this building's 17th-century successor. The present church, built on a new site to the north of the ancient graveyard, is of 19th-century date. As well as the slab attributed to St. Angus, the ancient, primitive font, probably of early medieval origin, is preserved in this building. There is a display on the history of Balquhidder in the church, which is open to the public during the summer, when there is also a programme of evening concerts in the building. The Callander and Oban Railway reached Balquhidder in 1871 but the line closed in 1965. The site of Balquhidder railway station is now a holiday park with log cabins, caravans, camping etc. Until 1993, Balquhidder had its own primary school, with a single teacher. Since this was closed, the children of the village have been schooled at Strathyre. The name Balquhidder is commemorated in other Scottish areas of the world including South Australia. A large sheep property in the hills of South Australia is called Balquhidder. The village is also commemorated in song in a traditional Scottish air, "The Braes o' Balquhidder", written by Robert Tannahill (1774–1810) which appears in R. A. Smith's "Scottish Minstrel" (1821–1824) – Vol. I, p. 49 and Vol. IV, p. 89, and which has been recorded by the Tannahill Weavers, among others. The "Wild Mountain Thyme" is a variant of this song. William Stewart of Baldorran (c. 1440 – c. 1500), founder of the Balquhidder Stewart clan. Rob Roy MacGregor, 18th century Scottish patriot, folk hero and outlaw, sometimes known as the Scottish Robin Hood. He was buried in Balquhidder Church yard. ^ "A story about drovers inadvertently playing cards with the Devil". June 1964. Retrieved 2013-06-16. ^ "Balquhidder". Ainmean-Àite na h-Alba. ^ a b c One or more of the preceding sentences incorporates text from a publication now in the public domain: Chisholm, Hugh, ed. (1911). "Balquhidder" . Encyclopædia Britannica. 3 (11th ed.). Cambridge University Press. p. 285. ^ "Clan Background". Ferguson Clan Society. Retrieved 2013-06-12. ^ Henderson, Lizanne; Edward J. Cowan (2001). Scottish Fairy Belief: A History. Dundurn Press Ltd. ISBN 1-86232-190-6. ^ Black, Sir James W. "Autobiography". The Nobel Foundation. Archived from the original on 6 February 2010. Retrieved 23 March 2010. Wikimedia Commons has media related to Balquhidder.